Poll: Did you use the Staples $100 off a tablet coupon? Fan of Lenovo? Well their tablet is about to make its debut on August 23rd. This 10.1" tablet is competitively priced at $479.99. Has ability to incorporate stylus for handwriting on tablet. Getting a smartphone has been a big trend for years now. They help people stay connected to work so they can get things done quickly and easily. 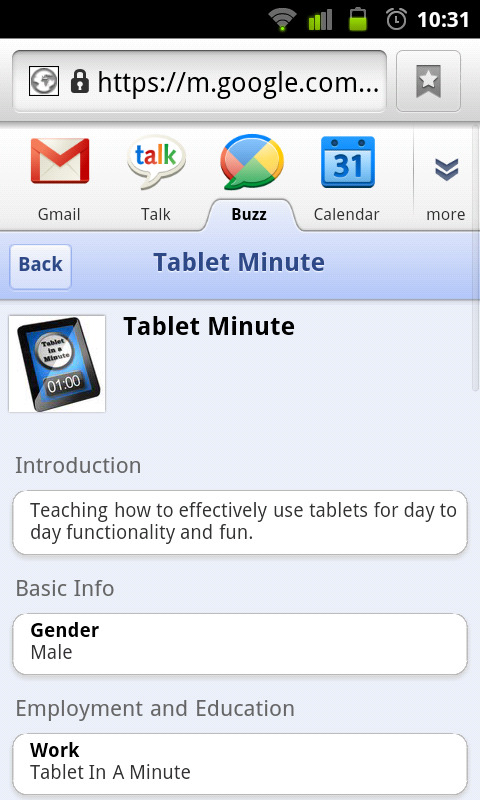 Tablets are finding there way into the business atmosphere even with the wide availability of smartphones. Samsung is making business easily accessible on the go with the first LTE powered Android tablet on Verizon. 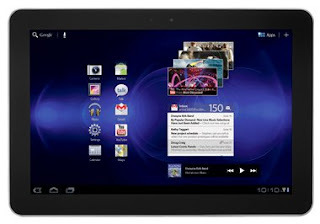 The Galaxy Tab 10.1 is the thinnest tablet on the market and adding the ability to connect to 4g and speeds of up to 20 m/b are really outstanding. For work or play, this is a really solid device to get what you want where ever you want it. Prices start at $529.99 on a 2 year contract with the data plan starting at 2GB per month for $30. For $80 a month you can pull down up to 10GB. 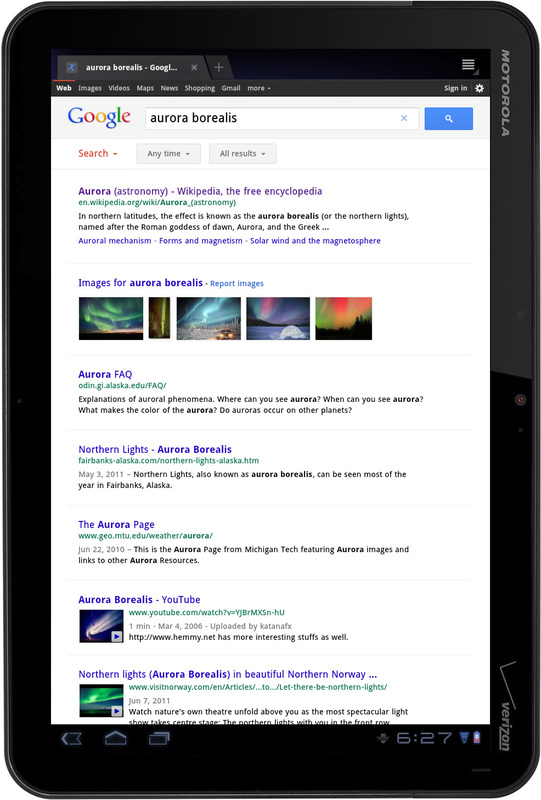 Using Googles web page on tablets leads to much zooming in and out to be able to see specifically what you want. Right now they are in the process of rolling our a optimized version for iOS and Android tablets running 3.1 and up. 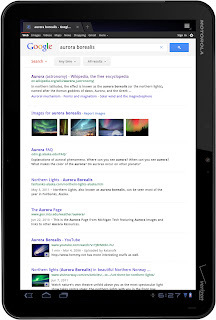 If you are on a tablet check out www.google.com and try it out. I had to clear my browser cache on my iPad to be able to see it. The new version is very clean and easy to use. Enjoy! After having my iPad for awhile, I realize that one of its best purposes is to show pictures. For years companies have been selling digital photo frames but I would say that the iPad is a much better viewing expierence. When you take a picture with the iPad it automatically goes in the the Camera Roll album. If you download a picture from the web or from an app it goes in Camera Roll. So if that is all you have done with your iPad you are missing out on the full potential of the Photos app. The process to put multiple albums of your own pictures together is very simple. Watch video for explanation or keep reading after the break for full details. Love the idea of having a tablet but can't let go of you laptop keyboard. How about a tablet that has a slide out keyboard. This tablet by Asus is demoed for us all to see and drool over. No word on US release or price. 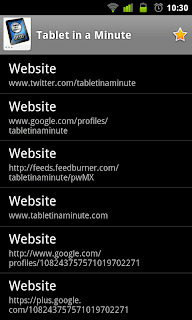 Phones and tablets are really the perfect devices to browse the web on the go. In this tutorial I shows you how you can add a website shortcut icon to the main screen on any Android device so you can quickly jump to your favorite site. If you would like to make a icon for your own website or blog, watch a tutorial here to learn how. The great things is that if you create a icon for your iPad, the icon is then made available on any iOS or Android device when you create a bookmark. 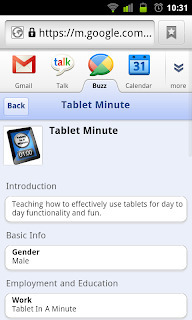 Asus Eee Pad Transformer Android 3.2 Available July 28th! 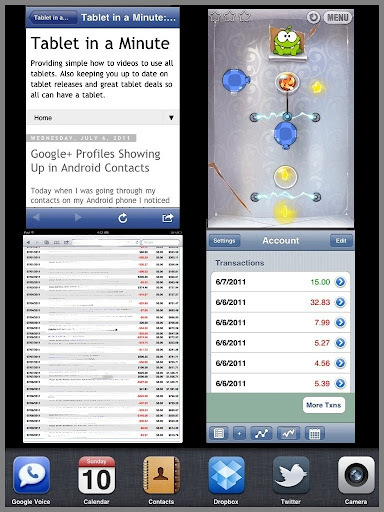 Tired of apps that looks skewed? 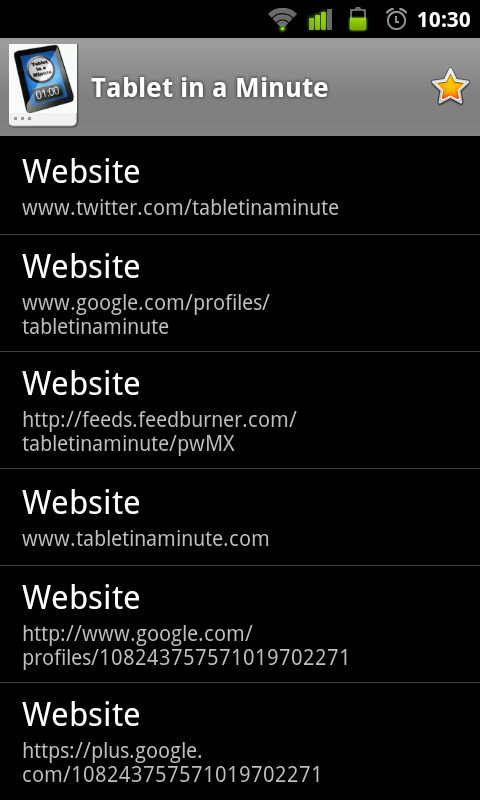 What if you could make them fill the fully tablet screen and format it the same way they do you your Android phone. That is what the Android 3.2 update brings and Asus is bringing that to the Transformer tomorrow. Don't have a Transformer? Get a great deal on one while you still have time. After using my iPad for a month now, I have learned the apps are really make it to be a useful device. I have downloaded hundreds of apps to find the perfect ones that I use on a daily/weekly basis. While these are my current favorite apps, I would love to help you find an app that you are looking for. 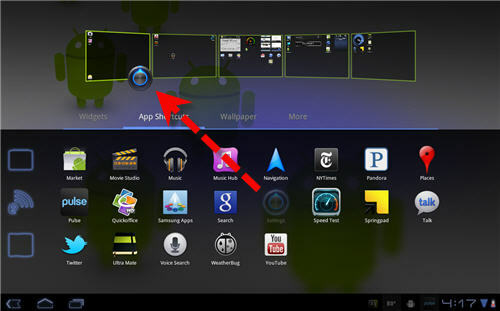 Leave a comment of your favorite apps or what type of app you would like help finding on the iPad. I will see if I can help point you in the right direction. Dropbox - This is the perfect app for accessing content from your computer. You can easily transfer PDFs to iBooks or browse through you photo albums and star your favorites for access offline. Evernote - The perfect note taking app. This app allows you to very easily record audio, upload multiple pictures, or take a quick snapshot of a memory you would like to keep. With simple notebook organization this app allows you to keep track of all your notes with ease. Flipboard - This is a very beautiful RSS reader. You can import content from Google Reader, Facebook, Twitter, or any feed. 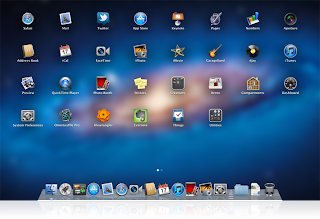 Remote - This tool allows you to easily see the different content that is on your computer and play it on your computer without getting up and going to the computer to change your selection.Works great if you have a Mac Mini connected to your HDTV. Air Video - This little app is super awesome it allows you to watch all of the movies from your computer right on your iPad without spending time syncing or taking up any of space on your iPad. DVP Remote - The best remote for the iPad to control the Roku box from an iPad. It is very fast compared to the one you get with the Roku box and it has a great interface. Twitter - This is by far the best Twitter app I have used on any device. It is perfect if you have multiple accounts you need to manage. It really allows you to very quickly consume all of the content in your feed. Web Albums - This app is the best way that I have found to view and upload Picassa web albums. iBooks - I do not purchase many books to read but iBooks is a perfert tool to allow you to import PDFs and read them easily and quickly. You can also sort your PDFs into collection to help you keep you content organized. HP iPrint Photo 3.0 - This app allows you to print photos from your iPad, works with most wireless printers. Netflix - Allows you to play Netflix instant play from you Netflix account. GeeTasks, the Google Tasks App - Simple app that syncs Google Tasks. This app allows you to check off lists, create lists, clear list, and edit information for each tasks. Epic Citadel - This is just a preview of the Unreal game engine but it really shows what great graphics the iPad is capable of. 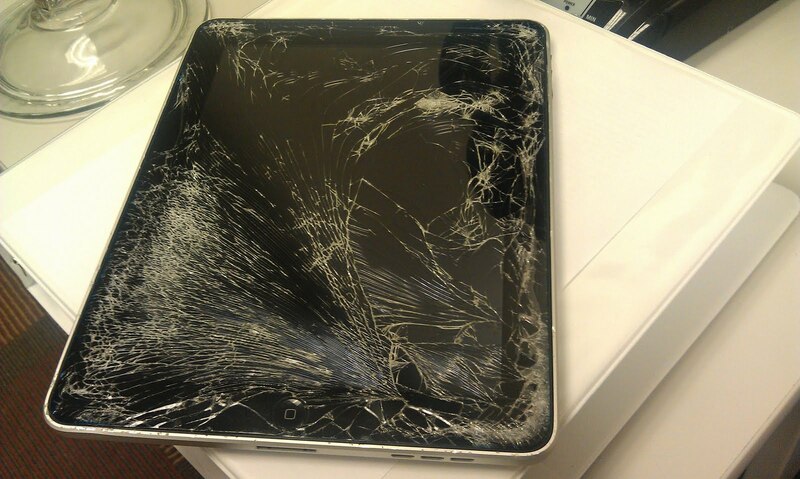 Fruit Ninja - A favorite casual gaming experience for everyone to enjoy. LEGO Harry Potter: Years 1-4 - Perfect game for the every Potter fan. Many levels to keep you entertained for hours. Cut the Rope - This game is very simple. It takes speed and accuracy to play but will keep your mind thinking with its challenging levels. Sprint introduced today that it is now offering the option to protect your tablet for $13 a month. The insurance is provided by Assurant Protection, the Assurant Advanced Protection pack provides repair or replacement in the event your device suffers mechanical or electrical breakdown or is accidentally damaged, lost, or stolen. Popular devices that would qualify are the HTC EVO View 4G™, Samsung Galaxy Tab™, and Dell™ Inspiron™ 11Z. You may enroll in the plan within 30 days of the new activation of new equipment purchase. This protection plan can really help keep your mind at ease if you are always on the go and could potentially be prone to tablet disaster. Sprint also reminds us that there is a $100 deductible for lost, stolen, or accidentally damage claims. Who would have thought that this would be so simple. It took me awhile to find it but glad I did. If you want to scroll through your albums on Google Music using the iPad you just need to use 2 fingers to scroll up and down. Don't miss this chance to get a great deal on your favorite tablet. Ends July 30th. Aren't satisfied with tablets so far? Lenovo just announced 2 new tablets, The ThinkPad, and IdeaPad K1. The ThinkPad will be available Aug. @ for $479 16GB version with a stylus. Hit the link for more info. 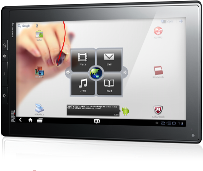 TheIdea Pad is also going to be the first certified Android tablet to run Netflix. Ok, here is the deal. I have posted a few Woot tablet deals before and they were pretty good, but todays is really awesome. 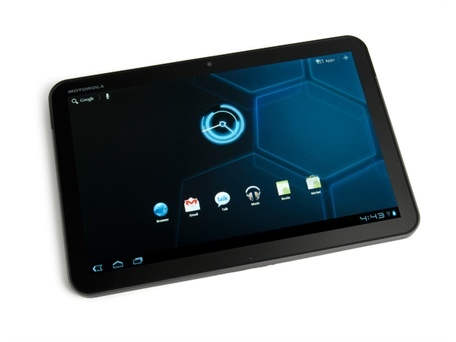 This is a 32GB, Dual Core, Motorola Xoom, running Android 3.1 for $399. That is $100 cheaper than the cheapest iPad and you get twice the storage plus all the amazing benefits of using a Google apps. So if you haven't bought a tablet yet, you really should, because they are awesome. Ends Thursday at midnight so get it before it is gone. Own a Galaxy Tab on Sprint? Get your Gingerbread update now.